That is the question posed on the box of the controversial (at the time) Odyssey²/Videopac game, K.C. Munchkin. That question also serves as a succinct synopsis of a game with an interesting history. Designed & programmed by Ed Averett and released for the Odyssey²/Videopac in 1981, K.C. 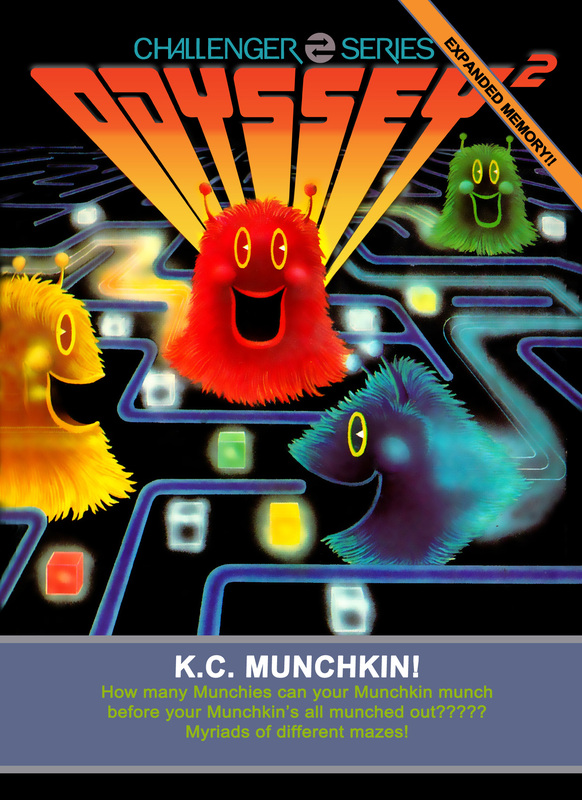 Munchkin is, in essence, a Pac-Man clone, one of many released for various home consoles in the early 1980’s. Phillips/Magnavox could not procure the rights to port Pac-Man onto home consoles, as the home console leader of the time, Atari, had paid for that privilege. However, any home console worth it’s retail shelf space needed to have a maze game available to satisfy the craving for Pac-Man gameplay. There was a fine line between copyright infringement and a providing a unique take on an existing game, and K.C. Munchkin straddled that line like no other. The similarities did not go unnoticed. After the game’s release, Atari sued Phillips as they were none too happy with the similarities between K.C. Munchkin and Pac-Man. See, Atari had exclusive rights to release the home port of Pac-Man on their wildly popular VCS console, but Phillips/Magnavox had beaten Atari to the store shelves with this release. Atari was afraid that consumers, unable or unwilling to wait to play Pac-Man at home, would buy an Odyssey²/Videopac along with K.C. Munchkin, which could erode potential future sales of their own official Pac-Man game. Atari lost the first round but finally won on appeal, forcing Phillips/Magnavox to pull K.C. from store shelves. This is widely considered the first video game-related copyright lawsuit and for that reason alone, K.C. Munchkin should be remembered. But how about the game itself? Is it really a blatant clone or are there enough differences to warrant its co-existence and continued enjoyment 3+ decades later? In K.C. Munchkin, you’re a fuzzy little blue character (or a munchkin according to the manual) running around a maze eating dots (called Munchies), and avoiding 3 multi-colored enemies called Munchers. There are only a total of 12 Munchies per screen. Four of them flash multi-colored that if eaten turn the Munchers purple, allowing K.C. to gobble them up and turn them into ghosts. The ghosts fly around the maze until they return to their regeneration point, typically located in the middle of the maze. After a short period of time, the Muncher will regenerate and re-enter the maze in an effort to again thwart K.C.’s Munchie chomping goal. What Pac-Man fans will immediately notice as a significant difference is the lack of dots or Munchies. As stated, there are only 12 on each screen, but the Munchies are constantly moving, which adds a new dynamic to the standard maze chomper. Additionally, when the last remaining Munchie is left on screen, it moves much faster and tries to evade K.C., so you’ll have to either corner it or predict it’s movements to meet it head on as you won’t be able to catch it simply by chasing after it. K.C. Munchkin (fun fact, the K.C. is a reference to Phillips Electronics then President Kenneth C. Menkin), is it’s own game, regardless of how close it may resemble Pac-Man on the surface. As we now know, it’s a time-honored tradition for video game developers to create games that are “inspired by” already existing and popular titles. We almost expect it, so the initial shock of seeing a game that looks and feels like Pac-Man but is called something else has certainly worn off. For me, there are just enough differences to make K.C. Munchkin special, and worth playing for any Odyssey² owner. All 4 of the regular mazes in K.C. Munchkin are fun in their own way but my favorite is maze #4 (option 3 on the console). This is the variation that has walls separating the maze into 4 quadrants with 3 Munchies per quadrant that K.C. must eat. In order for K.C. to get from quadrant to quadrant, he must either use the warp on the side of the maze – which only gives him immediate access to one other quadrant – or he must go into the center of the maze, which is the recharge station for the Munchers. An opening rotates from this location, allowing K.C. access to each of the 4 quadrants. This maze is the most inherently challenging and requires the most pre-planning. It’s easy to corner yourself with no flashing Munchie to make you invincible. If well planned out, you can also use the quadrants to your advantage and clear them out as the Munchies recharge themselves. Just beware of which quadrant they are let into when they’re ready to go! Forget the Pac-Man clone talk for a minute. Plug a K.C. Munchkin cartridge into your Odyssey 2 and power it up. Begin playing, moving the little blue guy around the screen, eating Munchies, avoiding Munchers. Inevitably you’ll get caught and a new game will begin, and then another, and another… Are you having fun? Thought so, and that’s all that really matters.